Fairbanks, Alaska (AK) – Explore Fairbanks President and CEO Deb Hickok signed a contract with China-based East West Marketing Corp. on Thursday, May 24, 2018 at the Grand Hyatt Beijing at Oriental Plaza, Beijing, China. The firm will represent Explore Fairbanks in the rapidly growing China to Alaska outbound tourism market. The contract was finalized during Governor Bill Walker’s "Opportunity Alaska" from May 19 through 30, 2018. Hickok was a participant. In addition to Hickok, present at the contract signing was Governor Walker as well as Zhenzhen Tan, public relations manager, East West Marketing and Jeff Roach, manager, Fairbanks International Airport. Also present were other participants of the “Opportunity Alaska” China Trade Mission to include Adriel Butler, owner of Borealis Basecamp and member of the Explore Fairbanks Board of Directors; Bernie Karl and Connie Parks-Karl, co-owners, Chena Hot Springs Resort; Juliet Shepherd, technology-led development project manager, Fairbanks Economic Development Corporation; and Jin Chen, chief operating officer, Alaska Skylar Travel. 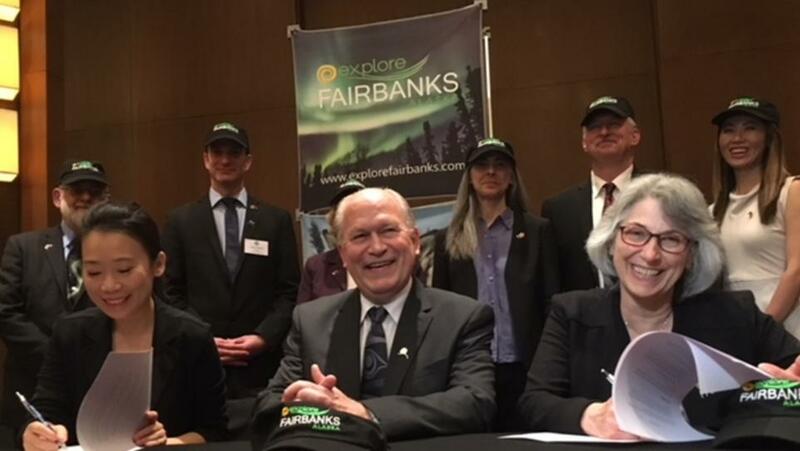 “This contractual relationship between Explore Fairbanks and East West marks another quantum leap for tourism from China to Alaska and for cultural exchange among our citizens,” said Walker. Among East West’s services for Explore Fairbanks will be to conduct sales calls and develop travel trade relations in China’s major cities, coordinate tourism sales missions for Explore Fairbanks and Alaska visitor industry partners, provide airline development support, assist with planning familiarization tours for China-based travel trade and media to come to Fairbanks, and conduct marketing campaigns through China social media channels. Explore Fairbanks is the first destination marketing organization in Alaska to have travel trade representation in the China market. About East West Marketing Corp. The State of Alaska is leading a trade and investment mission to the People’s Republic of China from May 19-30, 2018. Governor’s Office of International Trade (OIT) and the Department of Commerce, Community & Economic Development (DCCED), in cooperation with the People’s Republic of China, the U.S. Embassy Beijing and the U.S. Foreign Commercial Service, is coordinating business-to-government and business-to-business meetings, networking opportunities, events, and market briefings to promote Alaska companies in China. The delegation includes fisheries, tourism, and investment businesses, as well as a baby food maker, an architecture firm, and a university.